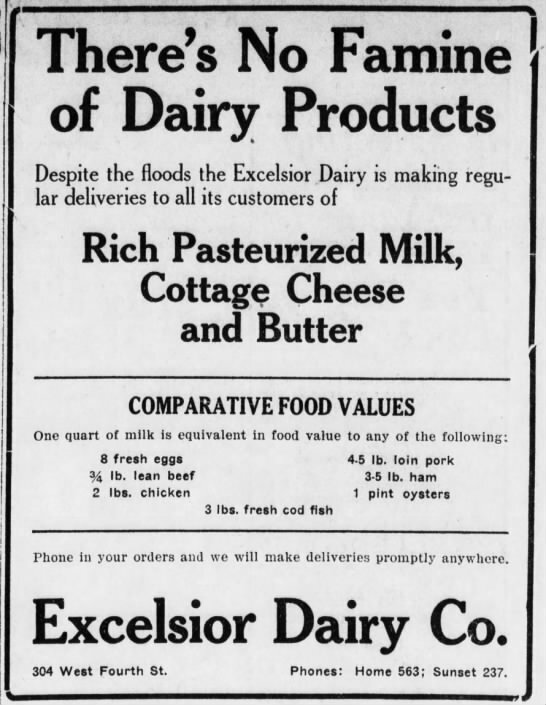 Excelsior Dairy ad from the Santa Ana Register, 1916. Alert reader Steve writes: "I recently ran across Ranney Avenue in Garden Grove and wondered who it was named after or what its history is. Do you know anything about it?" 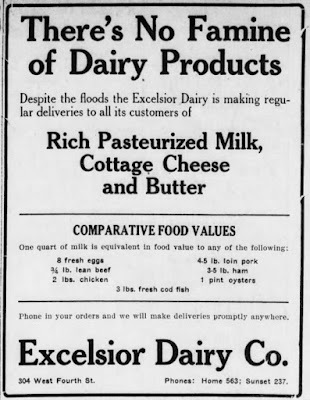 Walter D. Ranney founded the Excelsior Dairy in 1915. This successful business was later run by his sons. The dairy was headquartered on Westminster Blvd in Garden Grove. The ranch covered the area between Taft and Wright (Brookhurst) Streets -- Today’s Ranney Street runs right through the middle of it. The company was dissolved in 1954, but the Ranney's Excelsior Creamery Co. in Santa Ana continued to operate for some time thereafter. Walter Daniel Ranney (1875-1949), his wife, Florence Knettles Wycoff Ranney (1877-1949), and their four children moved from Groton, New York, to Santa Ana, California in 1913. That same year W. D. Ranney established the Ranney Sanitary Dairy. In 1915, he and Charles F. Heil bought the Excelsior Dairy, which Henry Russell and E. D. Burns opened in Santa Ana earlier that year. W. D. Ranney’s brother, Joseph A. Ranney, moved from New York to also join in the business, and in 1917 the name of the company changed to Excelsior Creamery. In 1920 they purchased Taylor’s Ice Cream Factory in Santa Ana and entered the ice cream business, selling Excelsior ice cream in chocolate, vanilla and strawberry flavors. In 1922 the Excelsior Creamery opened its $150,000 three-story complex on East First Street in Santa Ana. The Excelsior Creamery was the first in Orange County, California, to use the milk pasteurization process and to offer frozen orange juice for sale. In the 1920s they leased pasture land for the creamery’s cows in Round Valley, California, near Bishop, and in 1922 they purchased 400 acres to accommodate milk cows at Prado, California, just west of Corona. The Excelsior Ranch Company, created in 1930, separated the farming operations and dairy from the creamery, and in 1937 they purchased 100 acres of property in Garden Grove along with the cows and the dairy operations from Raitt’s Dairy (Orange County’s first dairy farm, which began operations in 1896). Following the Santa Ana River Flood of 1938, their Prado property was acquired through eminent domain by the government in order to build what became the Prado Dam, and afterwards all their dairy farming operations continued at what grew to be the 240 acre Seventeenth Street ranch in Garden Grove. The Excelsior Ranch Company dissolved in the early 1950s, the Garden Grove property was sold for the development of homes in 1953, and in 1957 Excelsior Farms was created and began cattle ranching in Norco, California. Upon its sale to the Los Angeles-based Carnation Company in 1980, the Excelsior Creamery’s sixty-five year dairy industry business came to an end.